We are dedicated to becoming your electronics service provider by aligning ourselves with your specific needs and expectations. Our repairs are completed in 5 to 10 days. Our prices are competitive and you get a one-year conditional warranty on repairs. Indcontrol makes a positive contribution to your bottom line by prolonging the life of your electronic equipment – saving you the capital cost of replacement and the downtime caused by breakdowns. Refurbishment of an electronic circuit board consists of adding/incorporating the latest technology to your products: It is an alternative, cost effective solution which should always be considered. “ Do you want to avoid the cost associated with technical problems? Indcontrol Electronics specialize in repair and refurbishing of obsolete equipment, industrial power supplies. We maintain your equipment quickly to get your systems working. 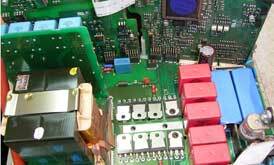 Indcontrol is a leader in specialized component level power supply repair. Our experienced staff is ready to support your machinery, mechatronic, pneumatic..